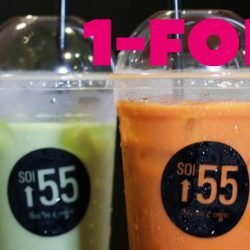 Till 31 Oct 2018 Soi 55: Get 1-for-1 Thai Milk Tea Every Weekday Before 5pm! 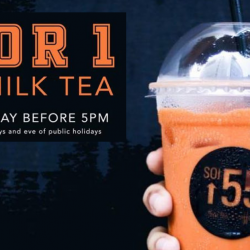 Get ONE FOR ONE Thai Milk Tea at Soi 55 every weekday before 5pm! Go get yours today! Promotion ends 31 October 2018. 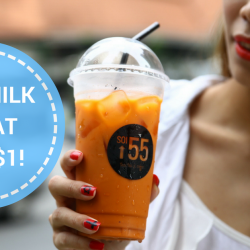 If you love Thai Milk Tea, don't miss this offer from Soi 55! Enjoy 1-for-1 Thai Drinks Series including Thai Milk Tea, Thai Rose Milk Tea, Thai Coffee, Thai Black Tea and more at their The Cathay and Ang Mo Kio outlets with this offer at Qoo10! If you work at the CBD area, head to Soi 55 at One Shenton for 1-for-1 drink from now till 9 June 2017! They will be moving from One Shenton to Old Airport Road Food Centre #01-144 after that. Valid for all drinks except Slushies and Pink Drink! 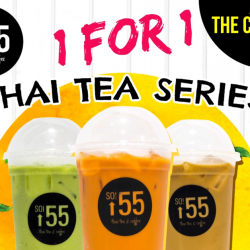 While stocks last Soi 55: Grab a $1 Drink Offer at AMK Outlet Now! Northerners, grab this $1 drink coupon for Soi 55 at Ang Mo Kio Blk 51 (besides S11 & McDonald's)! Less than 100 coupons left, grab it while stocks last! 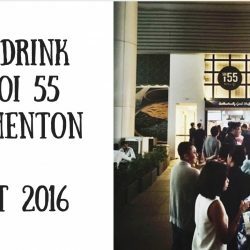 If you work at the CBD area, head to Soi 55 at One Shenton for a free drink today at their official opening! To get your free drink, show them that you have LIKED their FB page or FOLLOWED them on Instagram! Soi 55 @ Golden Shoe will be relocating to One Shenton come October 2016, and thus will be celebrating its last day on 26 August 2016 (Friday)! As a token of appreciation, they are having a $2 drink promotion AND giving out $1 DRINK vouchers from 22 - 26 August 2016 to thank you for your loyal support for the past 2 years! The vouchers will be redeemable at their new outlet at One Shenton once it opens. Try their Thai Iced Tea and coffee now! 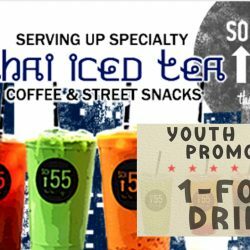 To celebrate Youth month in July, Soi 55 is offering 1-for-1 drink at their Cathay outlet for youths aged 15 to 35! 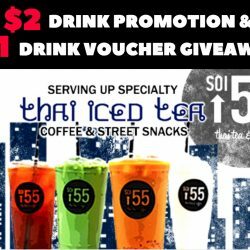 All you have to do is flash the Soi 55 coupon at their Cathay outlet and you are eligible to redeem a free drink! Valid only from Mondays - Thursdays for the month of July. Try their Thai Iced Tea and coffee now!